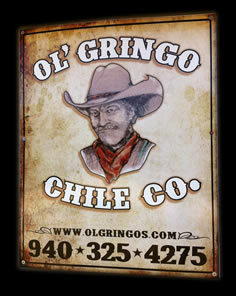 Tom at Ol' Gringo chile Company makes it a priority to know his customers. We strive to be the best in quality and customer service. Our goal is to create a long term business alliance. Customer feedback is greatly appreciated and this can be accomplished two ways. Social media is a great source such as Google, Yelp and Facebook but if you do not have an account with these on-line directories then the process can be tedious. For your conveneince you can send us your testimonial and we will publish it directly on our website. Click to submit your review on this website or click the appropriate directory listed below. Thank You for your testimonials! We appreciate your feedback. ~ For nearly 5 years now, you have been producing a wonderful steak sauce and three great hot sauces. All are bottled under the Black Bear label and well done. Our customers love the product and we love the branding opportunity on our table top. You have worked great on distributing this product through Sysco and we have enjoyed no issues in distribution. We look forward to years of growing our business together. I appreciate all that you do for Black Bear Diner. Bruce Dean, President at Black Bear Diners, Inc.